So, do you want to see if this Medical Astrology stuff really works? For an amazing demonstration of the validity of Medical Astrology, we need look no further than the life of Frida Kahlo, Mexico's famous woman artist and revolutionary, and wife of Diego Rivera, a famous mural painter. Her heart-rending life story was beautifully portrayed on the silver screen by Salma Hayek in the movie Frida. Frida's life was filled with a long series of accidents and medical tragedies that put her through a long series of operations, made her a frequent invalid, and gave her tremendous pain and suffering, not only physical, but mental, emotional and spiritual as well. In Mexico, she has earned the title of La Reyna de Dolor, or, The Queen of Pain. Frida's natal temperament, as indicated by the sign placements of the planets in her natal horoscope, shows a predominance of the Water element, supported equally by Fire and Earth, which are strong but fairly evenly balanced secondaries. In terms of modality, the Cardinal and Fixed modalities predominate, in roughly equal balance, with the Mutable modality weakest. Frida's evolving temperament, and the overall impact of her life on her state of health, as indicated by the house placements of her natal planets, is quite extreme. It shows an overwhelming predominance of the Air element, and of the Fixed modality. In terms of signs, Fixed Air is Aquarius; in terms of houses, it's the Eleventh House, where half of her natal planets are located. Frida came into this world with a lot of emotional sensitivity (Water) backed up by intense passion (Fire) and enduring pragmatism (Earth). She had a strong will and determination (Fixed), but was a precarious balance of dynamic tensions (Cardinal). The impact of her short life was to have an intensely Aquarian or Eleventh House influence on her. She was very active in the communist party, whose utopian ideals she espoused, and her stormy relationship with her husband, Diego Rivera, often rocked by his extramarital affairs, was often more one of friend and associate than husband and wife; all of these show an Eleventh House character. And she was plagued by circulatory problems, especially peripheral vascular disorders like gangrene and the pulmonary embolism that finally claimed her life, which grew worse the longer she lived. Frida's Ascendant in Leo, which has the heart and circulatory system, as well as the thoracic spine, as its vulnerable areas. Frida's Sun is also her Ascendant Ruler, and is in sensitive, emotional, motherly, Phlegmatic Cancer. Frida's life mission, which she realized so well, was to express her deep feelings and emotions through her paintings; her paintings were her life. With the Sun as Ascendant Ruler, her heart and circulatory function was critically important to her constitutional health and wellbeing; but it was beset by many afflictions. The Sun's conjunction with Neptune gave her artwork a fantastic, surrealistic flavor, but it also gave her lifelong problems with substance abuse, particularly tobacco and alcohol, but later painkillers, which were to weaken her circulatory system, quickening her degeneration in later life. Since her Cancer Sun was also loosely conjunct Jupiter in the same sign, her liver and arterial circulation were also weakened. Frida's natal Sun is in the Eleventh House, the house of its detriment, which further weakens the solar functions. But the glaring centerpiece of her chart is the opposition between her Cancer Sun and Mars conjunct Uranus, both retrograde, in Capricorn. They align along the Fifth / Eleventh house axis, which corresponds to Leo / Aquarius, the Circulatory Axis. Since this opposition is so critical, much more will be said about it later on. Since the Sun in a woman's chart is her animus, or male ideal that she projects out onto the important men in her life, especially her husband, and since Frida's Sun was so afflicted, it gave her many problems in her marriage. The opposition aspect also plays out in marriages and partnerships; in Frida's case, her Sun was opposed to volatile Mars and Uranus, which sympolizes her husband's infidelity and roving ways. Frida said that she had two big accidents in her life that gave her great suffering - the tramway accident and Diego - and that Diego was the greater one. Frida's Cancer Sun also gave her strong aspirations to be a mother, which she was never able to realize due to her big tramway accident (opposition to Mars and Uranus). The desire for children was further heightened due to the fact that these two opposing planets were in the Fifth House, which pertains to children. The strongest member of Frida's Vital Core was her Moon, exalted in Taurus, and in the Tenth House. The only classical aspect that the Moon makes is a sextile to Saturn in the Eighth house. Although the Moon is in the house of Her detriment in the Tenth House, it is still a Hylegaical house; and so, I feel that the Moon could be called Frida's Hyleg. It was a bulwark of good health and nurturing resilience that kept her bouncing back from her tremendous accidents, injuries and afflictions for as long as she did, in spite of it all. 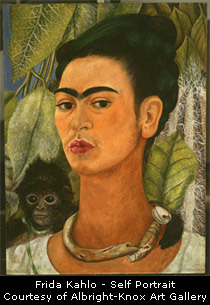 Frida had a very traditionally oriented, conservative mother. The central configuration in Frida's natal horoscope is the glaring opposition between her Sun and Neptune in Cancer, on the one hand, and her Mars and Uranus, both conjunct and retrograde, in Capricorn, on the other hand. The Cancer / Capricorn axis is the Nutritive / Structural Axis, but in her case, it was very structural. With the Sun opposing the dynamic and volatile Mars and Uranus, which often indicate accidents, Frida was like a fragile porcelain china doll, an accident waiting to happen. The transits and progressions that would set it off came when she had her big tramway accident. Frida's axis of the lunar nodes was also aligned along this sme pair of opposing signs, indicating a deep karmic involvement as well. Frida's Venus, also in the Eleventh House, is tightly conjunct Pluto, with less than a one degree orb. Venus symbolizes the female organs and uterus, and Pluto death, disfigurement and destruction - the wound of fate. Furthermore, this conjunction is fairly tightly squared to her Saturn in the Eighth House, which pertains to sexuality and reproduction, as well as to transformation and surgery. Saturn's general influence is towards deficiency, barenness and infertility. Saturn also disposits her retrograde Mars and Uranus, which were key planetary factors involved in her big tramway accident. This Venus Pluto conjunction was also targeted by several challenging transits on the day of her accident. Because of her tragic tramway accident and the destruction and disfigurement to her womb that it caused, Frida could not have any children. She tried, but had tragic miscarriages. Because her natal Sun in Cancer, the sign of motherhood, was in opposition to her retrograde Mars and Uranus in the Fifth House of children, her desire to have children and become a mother was very strong. It would be many years before Frida finally resigned herself to the fact that she couldn't have children. Frida was also known for her bisexuality, and for her extramarital liaisons with other women. Her natal Ascendant was in Leo, the most masculine, emissive sign of the zodiac, which gave her brash, tomboyish behavior in her youth, but this alone wasn't sufficient to make her bisexual. Her natal Mercury, an inherently bisexual or hermaphrocitic planet, also in the sign of Leo, is totally unaspected to any other planet. Unaspected planets tend to function like loose wires, or odd anomalies that haven't been integrated into the overall structure of the personality. Mercury's dispositor, the Sun, is in a tight opposition with Mars (libido) and Uranus (unusual, bizzare, eccentric). As we saw earlier, this configuration played out in her stormy relationship with philandering husband Diego Rivera. These two manifestations of this planetary configuration were actually connected; because Diego was aware of the devastating effect his infidelity had on Frida, he was tolerant of her bisexual affairs. Another interesting thing about Frida's unaspected Mercury is that it happens to be the planet activated by her Sun / Moon midpoint, which shows the balance point of the masculine and feminine energies in her being; she was equally balanced, and could go either way. Frida's Mercury was also the dispositor of her Venus / Pluto conjunction in the dual sign of Gemini, which led her to live an intensely passionate (Pluto) but double life (Gemini) when it came to love and sexuality (Venus / Pluto). In her later life, Frida was plagued by kidney infections. Although not immediately apparent, the source of this vulnerability comes from the central set of oppositions in her natal horoscope. All opposing each other within an orb of about 3 degrees, you have the Sun and Neptune on the one hand, and Mars and Uranus on the other. The Sun and Uranus are the dispositors of Leo and Aquarius, the signs on her First / Seventh house axis, which corresponds to Aries / Libra, the Renal Axis, which made her kidneys weak and vulnerable in later life. Neptune also opposes Mars, activating the Immune midpoint in conjunction with this same Sun / Uranus opposition; also involved is the Sun / Mars opposotion, activating the Choleric midpoint, also in conjunction with this same opposition, predisposing her to inflammation and infection in the renal area. As we saw, Frida's Venus / Pluto conjuunction, squared by Saturn, gave her problems with her female organs, which were critically injured when this conjunction was targeted by her big tramway accident. Besides the female organs, Venus also pertains to the kidneys and urinary tract which, being in the same general anatomical area, were also probably greatly weakened by the injuries she received in that big accident as well. At age six, Frida had a bout with polio that severely stunted her right leg and foot; after that, it would always remain thinner and weaker than her left leg, and she would walk with a limp. Her classmates at school cruelly called her "Pegleg Frida". The illness was quite severe, and left Frida bedridden in recovery for nine months. Frida's medical records at that time were rather vague, and it is unclear exactly when the onset was, or if it was in fact polio. But it left her right leg weakened and vulnerable to injuries, as well as the gangrene and circulatory problems she would have later on in life. In early July 1913, transiting Uranus was retrograde at 6 degrees of Aquarius, opposing Frida's natal Mercury (nervous system) in the Twelfth House (corresponding to Pisces, which rules the feet). She was an invalid for nine months, which also pertains to the Twelfth House, which rules invalidism. The illness left her with a vulnerable Achilles' heel, so to speak. Unfortunately, the various substance abuse problems she had (Neptune) weakened her circulatory system (natal Neptune conjunct natal Sun), and aggravated this weak spot. Neptune is the modern ruler of Pisces, and through the essential sign / house correspondences, also has an essential affinity for the Twelfth House. On September 17th, 1925, Frida had her big tramway accident, which was to change her life forever. She and her boyfriend were riding the bus home from school when it was hit broadside by a tram car. Frida sustained multiple injuries: a broken pelvic bone, her spinal column fractured in 3 places, a broken collarbone and ribs, eleven fractures in her right leg, a crushed, dislocated right foot, and a dislocated shoulder. An iron handrail impaled her abdomen and pierced her uterus. Frida was shattered to pieces like a fragile china doll. It would be the start of a life filled with chronic pain, and some 33 operations. This was the biggest, most fated event in Frida's life. As such, it wasn't associated with just one major transit or planetary event, but with several. Transiting Sun and Mars, in such tense opposition in Frida's natal chart, were transiting through the barren sign of Virgo, the virgin, conjunct each other and tightly squaring her natal Venus / Pluto conjunction. Transiting Uranus, at 23 degrees of Pisces, was squaring her natal Venus / Pluto conjunction from the other side, and opposing transiting Sun and Mars. Mars and Uranus, transiting in hard aspect, indicates accidents; these same planets were retrograde in her natal chart and afflicting her natal Sun by opposition. Not only did her natal chart, with the volatile Sun opposition to Mars / Uranus along the structural Cancer / Capricorn axis, indicate a predisposition to accidents and trauma to her skeletal system, but these very same planets were afflicting her natal Venus / Pluto conjunction, indicating a potential for damage and destruction to the female reproductive organs, in a tense T-square. Because Mars, which indicates knives, weapons and sharp phallic objects, was involved in this transiting T-square to her natal Venus / Pluto conjunction, her uterus was impaled by an iron (Mars' metal) handrail. At the same time, transiting Pluto, indicating death and destruction, was conjunct Frida's natal Sun, indicating that her life was in mortal danger. Transiting Pluto, at 14 degrees Cancer, was tightly opposed by transiting Jupiter, at 12 degrees of Capricorn, sitting right in the middle of her natal Mars / Uranus conjunction. Since Jupiter magnifies everything He touches, the volatility of these two planets, Mars and Uranus, and their threat to her natal Sun (life and health) by opposition, was magnified. Transiting Neptune, natally conjunct her Sun, the Ascendant ruler of her natal horoscope, was conjunct her natal Ascendant very precisely on the day of her accident. Since the Sun, her natal Ascendant Ruler, rules the vision, and Neptune can hide, blur or obscure things, it was almost as if she couldn't see her big accident coming - that she had a big psychic blind spot. Neptune, being the essential dispositor of the Twelfth House, which rules invalidism, conjunct the Ascendant, which rules the physical body, symbolized the fact that this big accident would put her out of commission for a very long time, which it did. It was during her long recovery that Frida took up art; the surrealistic quality of her artistic expression (Leo) has a fantastic, Neptunian flavor. Frida could easily have died on that fateful September day. But there were also some favorable transits happening on that day, involving supportive, harmonious aspects, which saved her. The transiting Moon, at 19 degrees of Virgo, was sextiling her natal Jupiter, exalted at 20 degrees of Cancer. Transiting Saturn, at 11 degrees of Scorpio, was trining her natal Sun, supporting the will to live and survive. At the time of her accident, the transiting North Node of the Moon was at one degree of Leo, the sign of artistic expression, and squarely within Frida's natal Twelfth House, which governs invalidism and hospitalization. Frida's natal North Node, indicating the direction of optimum spiritual unfoldment for her life, was also on the cusp of her Twelfth House. Her accident, as unfortunate as it was, was not without its blessings, because it was while she was bedridden, with nothing else to do, that Frida took up painting, which proved to be her spiritual path in life. Previous to her accident, Frida was planning to become a doctor. Frida's big tramway accident left her unable to have children, even though, due to the Fifth / Eleventh house axis, which is so emphasized in her natal horoscope, she wanted children very much. One major focus of the planetary transitis converging on Frida at her accident was her natal Venus (female organs) / Pluto (death, destruction) conjunction, which was squared from the Eighth House (transformation, transfiguration) Saturn (bones). Her uterus had been punctured by an iron handrail (Mars) at the accident, and her pelvic bone (Saturn) had been fractured so that a portion of it was sticking into her uterus, which made it impossible for her to carry a pregnancy to full term. Still, Frida persisted, expressing all the Plutonian grief that her miscarriages would bring through her artwork and paintings. It would be several years, and several failed pregnancies later, before Frida finally gave up on having children. Frida's biggest and most tragic miscarriage was in Detroit, Michigan, USA on July 4th, 1932. On that day, Frida, who had been pregnant for three and a half months, was hospitalized for severe hemorrhaging, and later miscarried. Astrologically, transiting Uranus was trining Frida's Ascendant from 23 degrees of Aries and squaring her nodal axis, and was conjunct her progressed Moon. Natally, Uranus is in her Fifth house of children, and rules her Seventh House of marriage. Frida's natal nodal axis was also the focus of other transits and progressions: transiting Pluto was conjunct Frida's natal North Node, as was progressed Jupiter. The planet that disposits Frida's natal North Node in Cancer is the Moon, which governs gestation and childbirth in women. The miscarriage came right after the New Moon; the lunar quarters often precipitate medical crises. Also, Frida's progressed Pluto, at 24 degrees 15 minutes of Gemini, was only 5 minutes away from an exact conjunction to her natal Venus. When Frida was only 6 years old, she had polio, which left her with a weakened and emaciated right leg. We saw that, in that year, transiting Uranus, moving retrograde, directly opposed her natal Mercury in Leo. The two planets opposed each other along the Leo / Aquarius Circulatory Axis; and so, the blood circulation in Frida's right leg was severely compromised, making it vulnerable to circulatory problems later on in life. The planets involved were Mercury and Uranus, indicating a neuromuscular disease - polio. But because the Leo / Aquarius axis was involved, the effects would be felt in the circulatory system. Frida's first operation to her right leg was to remove the ends of three toes, which weren't receiving adequate circulation. Transiting Pluto (surgery, disfigurement, transformation) was conjunct her north lunar node, which is on the cusp of her Twelfth House, corresponding to Pisces, which rules the feet. Also, transiting Mars, dealing with knives and surgery, was on Frida's Descendant, corresponding to doctors. Here again, the Leo / Aquarius Circulatory Axis was emphasized, since transiting Mars was opposing Frida's natal Ascendant in Leo. In 1949, gangrene became apparent in Frida's right foot. All throughout that year, we find planetary transits that are challenging to Frida's circulation, and to her right leg and foot. On January 13, 1949, transiting Mors was at 6 degrees of Aquarius, opposing Frida's natal Mercury along the circulatory axis. On April 11th, transiting Mars, at 13 degrees Aries, was squaring Frida's natal Sun / Mars opposition along the Fifth / Eleventh house Circulatory Axis, and had also squared the midpoint of her Sun / Uranus opposition, heightening the circulatory involvement. On April 20th, transiting Neptune (lymphatic circulation) was squaring Frida's natal Sun from 13 degrees Libra. In mid-February, Jupiter, ruling the arterial circulation, was opposing natal Jupiter; by late August, it was opposing Frida's natal North Node on the cusp of her Twelfth House, corresponding to Pisces, which rules the feet. The doctors wanted to amputate, but Frida resisted. Finally, in August of 1953, Frida's right leg, totally infected with gangrene, was amputated below the knee. This was a great blow to Frida, who, being a bold and independent spirit, lost all independence and mobility. In 1950, Frida had had to endure some 7 spinal operations, which had left her, in 1951, in corsets, with painkillers and morphine, being bedridden most of the time, with nurses to look after her. On the 9th of August 1953, transiting Mars conjoined Frida's natal Twelfth House (Pisces, feet) Mercury. Transiting Saturn conjunct transiting Neptune in Libra was squaring Frida's natal nodal axis, also affecting her Twelfth House, which became exact on the 23rd. Transiting Uranus was also closing in on her natal North Node, heightening the nodal emphasis. Transiting Pluto, indicating transformation and surgery, was conjunct Frida's natal Ascendant (physical body); this event would indeed darken Frida's spirits and outlook. This shadow was to remain over her until her death. Frida's Death: Natural Causes - Or Suicide? Frida's death, and the circumstances surrounding it, are very controversial. Although she had been suffering from pneumonia, and the offical cause of death on her death certificate was a pulmonary embolism, many believe that it was actually suicide. Frida died in her sleep during the night, sometime in the early morning on July 13, 1954. The nurses' pill count of the painkillers she had been taking showed that Frida had taken four more pills than her usual dose - but did this constitute an intentional lethal overdose - or did her torured, weakened body just simply give out? Frida had left a number of clues over the preceding months that hinted of suicide, but none of them are conclusive. Perhaps Frida, being the woman of mystery that she was, wanted to keep us guessing. In the February 11th, 1954 entry of her diary, Frida writes that she keeps wanting to commit suicide, but her love for Diego stops her. "I will wait a little while", she adds. On the eve of her death, Frida gave Diego a gold ring for their upcoming 25th wedding anniversary. Her reason for giving him his gift early was "...because I feel I'm going to leave you very soon..." Did she give him this gift early because she knew that her health was quickly failing her... or because she was planning to commit suicide that evening? Perhaps the planetary transits to her natal horoscope around the time of her death can shed some light on her circumstances and, more importantly, on the condition of Frida's mind and spirits as her end drew near. And, to be truthful, that picture doesn't look too bright. The transiting Sun, in her natal Cancer, was applying to a square with transiting Neptune, indicating that her spirits were low, and that she was feeling rather helpless. The transiting Sun, at 20 degrees of Cancer, was also conjoining her natal Jupiter, so there could also have been a sense of philosophical transcendence to her attachment to life. Three months earlier, on April 11th, with the transiting Sun opposing transiting Neptune and squaring her natal Jupiter, Frida had been hospitalized for an unknown illness; some say it was a suicide attempt. Hard aspects between the Sun and Neptune depress not only the spirits, but also immunity as well. It was at about the time of this initial Sun / Neptune opposition that Frida's pneumonia, which was to be her final illness, began. Transiting Mercury had been going retrograde through Cancer, inducing quietude and introspection. At the time of her death, transiting Mercury was at 9 degrees of Cancer, and had just completed an opposition to her natal Uranus; shortly before, Mercury had conjoined her natal Neptune, and before that, her Sun. These transits doubtless put her in a very meditative mood, wanting to dissolve the bonds that tied her to a life filled with pain, and the Uranus transit brought the final desire for spiritual liberation. Transiting Jupiter had just completed an opposition to her natal Uranus, heightening the desire for liberation and release, and was moving on towards an opposition to her natal Mars. Transiting Uranus was conjoining Frida's natal North Node, which also indicated that it was time to move on. But perhaps the transit most suggestive of suicide was that of transiting Pluto, which was exactly conjunct Frida's natal Ascendant at the time of her death.